SyART Sorrento Festival is a mix of ideas, emotions and dreams, a festival dedicated to contemporary artists from all over the world. Following the success of the second edition, the event takes on a new image. The Kermesse is hosted, every year, in the wonderful location of Villa Fiorentino, home of the Fondazione Sorrento, a place where history, traditions, art and culture interact with the guest. Historic home that has dedicated exhibition routes to artists such as Mimmo Paladino, Marc Chagall, Salvador Dali and Francis Bacon. 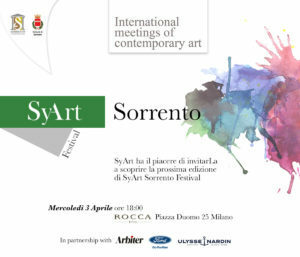 SyART Sorrento Festival is part of the Sorrento Foundation’s international events, which usually takes place in Spring and hosts events and encounters to animate the exhibition days. The didactic, fondamental activity, affects many local schools, but also national and foreign institutes, attracting the attention of students from all over the world. There are also training sessions for foreign and Italian students. 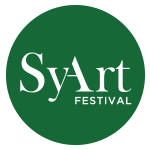 The art works selected at the Event will be exhibited during the year in Syart-space, a gallery linked to the event, located at the entrance of the Villa Comunale di Sorrento, one of the most impressive place of the city. The Event is a showcase for contemporary artists, an opportunity for dialogue, opening, exchanging and confronting young artists and historical international names. Artists interested in exhibiting at the third edition of SyART Sorrento Festival May 11-June 9, 2019 can send their application to our email address. We will provide further instructions to the selected artists. Deadline January 30.